I’ve been taking part in an OSU Extension program called Oregon Season Tracker (OST) for about five years. 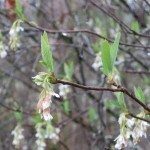 OST is a citizen science program where volunteers keep track of rainfall and plant phenology (seasonal growth patterns) and submit their records to national databases. OST also connects natural resources managers, landowners, educators, and others in the community with researchers and their science. At our office in St. Helens, we have an approved rain gauge which we try to check each morning, and a phenology “garden” consisting of two large Douglas-fir trees and some native shrubs. My cats get me up every morning by 7:30. They get fed. I check the rain gauge. Then I record the amount and other observations on a website. After more than a year, I have a habit. It’s simple, useful, and fun. We’re five years into reforesting a clearcut. The early spring after our first planting was unusually dry, but the effects varied a lot even on our small forest. Clatskanie averages almost five feet of rain a year. 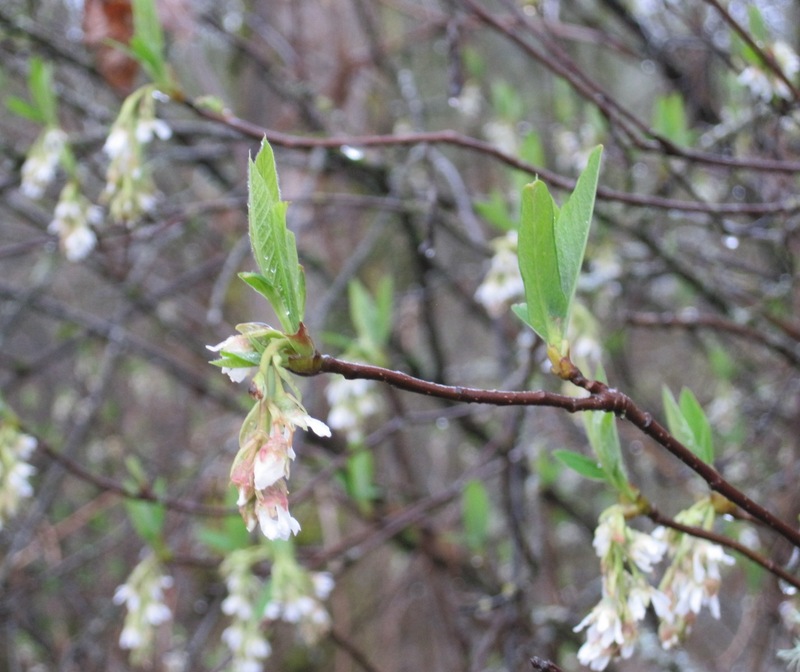 Even so, we lost a lot of site-adapted seedlings because they dried out – in February and March. Soil differences played a role. But where we were able to irrigate a bit the trees thrived. Posted in There's an app for that. The holidays are winding down; gifts given and received, time spent with friends and family; Christmas trees soon will be un-decorated (and some will be repurposed for the fish). 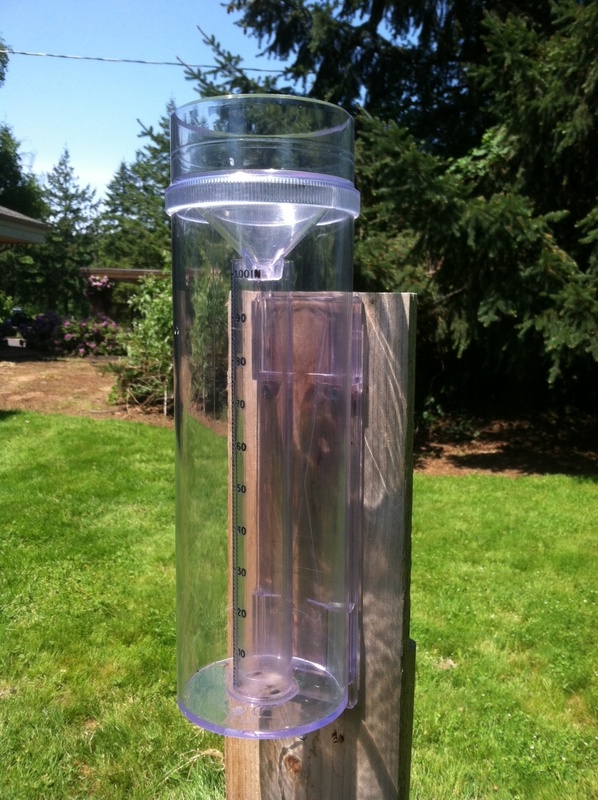 This year I bought our Extension office a holiday gift: a CoCoRaHS rain gauge. CoCoRaHS stands for Community Collaborative Rain, Hail and Snow Network. It is a national network of citizens who collect and report precipitation data using a standardized system. Having data collection points dispersed all across a region helps scientists understand localized weather patterns. In Oregon, the CoCoRaHS project is supported by the Oregon Climate Service, which is housed at OSU. 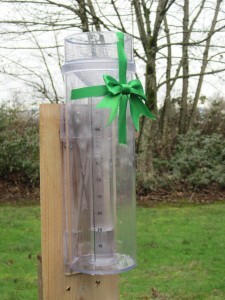 We set up our rain gauge a few weeks ago in a clearing outside our office. We put the data recording form on the fridge in kitchen. The first willing person goes out and checks the gauge in the morning. And now our data shows up on the CoCoRaHS map! Based on our few weeks’ experience, participating in CoCoRaHS has been fun, easy, and educational. If you want to get in on it, the CoCoRaHS website has all the information you need to get started. We also plan to do some local workshops next year for Master Gardeners and woodland owners to help populate the map with more data points. Stay tuned for the dates and details. As thoughts turn to the New Year, I’m pleased to announce that we will have a new contributor to this blog in 2013. Brad Withrow-Robinson, Forestry & Natural Resources Extension Agent for Linn, Benton and Polk Counties will be sharing the writing with me and sharing his insights on woodland management with all of you. You can share, too. Pass TreeTopics along to a friend, and pass your article suggestions on to us.